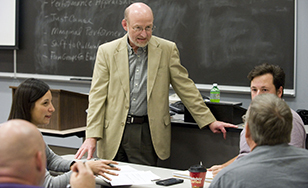 Bob Hartl, associate management professor, works with a masters-level class. Posting significant enrollment growth, the College's MBA program has once again landed on Minneapolis/St. Paul Business Journal's list of top programs in the state. St. Scholastica moved up two spots to the no. 8 position on this year's list, which ranks the top 25 MBA programs across Minnesota according to enrollment size. St. Scholastica saw strong growth in the past year, enrolling 227 students during the fall 2015 term. That's an increase of 28.2 percent from this time last year. Out of all the top 10 MBA programs, St. Scholastica saw the largest rate of increased enrollment. That increase doesn't include the 37 students registered in the College's online MBA for rural healthcare or the 21 students enrolled in a new Hibbing cohort. The College's MBA is characterized by flexibility for working adults, with evening classes offered on its campuses in Duluth, St. Paul and St. Cloud. Program applicants can complete the program in as few as 16 months. The program focuses on helping students develop leadership and change management skills, cultural competence, and ethical decision-making.